Strychnine poisoning is uncommon, and in most severe cases, the patient dies before reaching hospital. The management of strychnine poisoning is well documented, although there are few data on the kinetics of elimination of strychnine after overdose. A 42-year-old man presented shortly after ingestion of an unknown quantity of strychnine powder. After a respiratory arrest, with intensive supportive management requiring admission to an intensive care unit, he survived. Eight serum samples were taken over the first 5 days and analysed subsequently for strychnine concentrations. 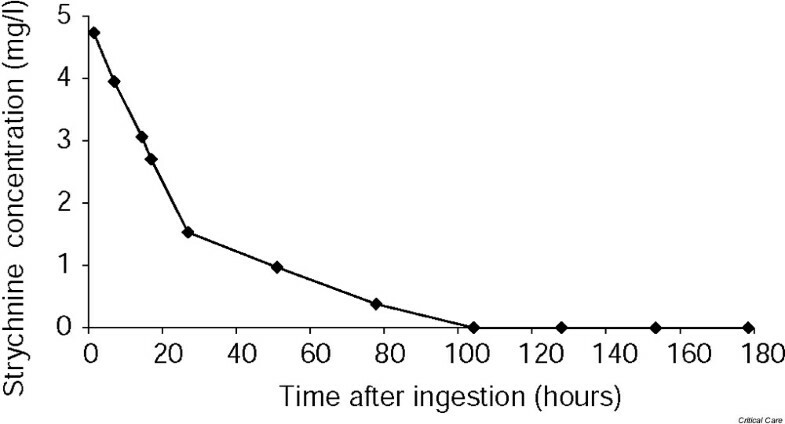 The initial concentration at 1.5 hours after ingestion was 4.73 mg/l, falling to 0.38 mg/l at 74 hours postingestion. Serum concentrations followed a monoexponential elimination curve with a calculated elimination half-life of 12 hours. Strychnine poisoning presents with classical features, and with early diagnosis and supportive management, the patient can survive. The initial serum concentration of 4.73 mg/l is the highest reported concentration in a patient who has survived. Previous reports of the elimination half-life have suggested it is between 10 and 16 hours, which conforms to the elimination data in our case. Strychnine is a bitter, white, powder alkaloid derived from the seeds of the tree Strychnos nux-vomica. It has had an interesting past, initially having been introduced in the 16th century as a rodenticide, and until recently it was used as a respiratory, circulatory and digestive stimulant . It is no longer used in any pharmaceutical products, but is still used as a rodenticide. Strychnine is also found as an adulterant in street drugs such as amphetamines, heroin and cocaine [2,3]. Strychnine poisoning is uncommon, and in most severe cases, the patient dies before reaching hospital . The management of strychnine poisoning is well documented, but there is less information available about the elimination kinetics of strychnine. We report the toxicokinetics of strychnine in a patient who survived a deliberate strychnine ingestion. A 42-year-old man with no significant past medical history presented approximately 1 hour after ingestion of a bottle of wine together with some "white powder" from his garden shed (this was later confirmed to be strychnine). He was able to walk in to the Emergency Department, but he was agitated and ataxic, in keeping with his ethanol intake. Within a few minutes of his arrival, his condition rapidly deteriorated and he developed a marked tremor and muscular spasms and shortly after this had a respiratory and secondary cardiac arrest. At this stage he was intubated and ventilated, and cardiac output returned after 5 minutes. He was transferred to the intensive care unit (ICU) and the National Poisons Information Service (London) was contacted for further advice on management. He continued to have marked muscle spasms and so was paralysed with 0.1 mg/kg pancuronium given intravenously. He was given 50 g activated charcoal via a nasogastric tube. Postarrest, his blood pressure was 85/40 mmHg, heart rate 96 beats/min and temperature 38.2°C. Arterial blood gases showed a severe metabolic acidosis (pH6.51, PaO2 9.5 kPa, PaCO2 2.6 kPa, HCO3 3.7 mmol/l, base excess [BE] -18) and he was given 3 mmol/kg 8.4% sodium bicarbonate; his metabolic acidosis improved over the next 8 hours (pH7.26, PaCO2 5.35 kPa, PaO2 13.4 kPa, HCO3 18 mmol/l, BE -9). He remained hypotensive despite fluid resuscitation and over the first 24 hours he required norepinephrine to maintain his blood pressure (maximum dose 900 g/h). His temperature rose to 39.9°C on day2 but settled after simple cooling measures and rehydration. His creatinine kinase peaked at 8218 IU/l, (although there was no evidence of myoglobinuria) and his creatinine peaked at 194 mol/l on day 2. He was extubated on day3, initially with some persisting twitching and muscular spasms, requiring boluses of midazolam and diazepam and an alfentanil infusion for analgesia. By day5 he was asymptomatic and his renal function had returned to normal. He was discharged from hospital on day10 after psychiatric assessment. Eight serum samples were obtained over the first 5 days and subsequently analysed on a Hewlett-Packard 6890 gas chromatograph (Stockport, Cheshire, UK) equipped with a nitrogen phosphorous detector for strychnine concentrations. A Restex RTX 1 column was used with an isothermal oven temperature of 270°C. The injector and detector temperatures were set at 250°C and 300°C, respectively. The strychnine concentrations are shown in Fig. 1; the patient's initial concentration at 1.5 hours after ingestion was 4.73 mg/l, falling to 0.38 mg/l and to 0 at 74 hours and 100 hours postingestion, respectively. The data conformed to a monoexponential elimination curve and the calculated elimination half-life was 12 hours. Serum strychnine concentrations in a patient with severe strychnine poisoning. Strychnine poisoning is an uncommon but potentially fatal poisoning and most patients die before reaching hospital. In the case presented here, the patient presented early after ingestion. He was initially asymptomatic but rapidly developed severe muscle spasms leading to respiratory arrest. With meticulous supportive care in the ICU he made a complete recovery. The mechanism of action causing strychnine toxicity is well understood. This poison is a competitive antagonist of the inhibitory neurotransmitter glycine at receptors in the spinal cord, brain stem and higher centres . It results in increased neuronal activity and excitability, leading to increased muscular activity. The classical features of strychnine poisoning occur from 15 to 30 minutes after ingestion and include heightened awareness, muscular spasms and twitches and hypersensitivity to stimuli. In large ingestions, these can progress to painful generalised convulsions, during and after which the patient retains consciousness. The cause of death is usually respiratory arrest secondary to respiratory muscle spasms , although prolonged muscular spasm can lead to hyperthermia, rhabdomyolysis and associated renal failure due to myoglobinuria [7,8]. Severe metabolic acidosis can occur due to increased lactate levels following repeated muscular activity, although the lactate is rapidly removed once the muscular spasms have been controlled . Prompt recognition of poisoning and initiation of treatment are required to prevent deterioration and death. Control of convulsions and muscular spasms requires either high doses of benzodiazepines, such as 1 mg/kg diazepam [9,10], or, in resistant cases, paralysis with neuromuscular blockers such as pancuronium . In addition, meticulous supportive care is required, and careful monitoring and observation for complications such as acute renal failure. Clinical effects of strychnine ingestion have been seen at doses as small as 2 mg in a child and 20 mg in an adult [12,13]. Survival after ingestion of large amounts has been reported: 480 mg (24 mg/kg) in a child and 3750 mg in an adult [14,15]. Death from strychnine ingestion has been reported in adults after doses as low as 5 to 10 mg . Since severe, life-threatening features have been reported after the ingestion of small amounts and patients can deteriorate rapidly, strychnine ingestion should be regarded as potentially fatal and the patient should be admitted to an ICU for close observation and appropriate treatment. In this case, as with many other reported cases, both the concentration of strychnine in the preparation ingested and the amount taken were unknown. The serum strychnine concentration of 4.73 mg/l at 1.5 hours postingestion is the highest reported concentration that a patient has survived. In previous reports, concentrations of 2.1 mg/l at 3 hours  and 3.8 mg/l at 0.5 hours  caused death. The potential fatal serum concentration of strychnine is not known and clinical features rather than the serum concentration should guide management. At a postmortem, less than 4 hours after an intentional ingestion of strychnine, a serum concentration of just 0.33 mg/l was found . A postmortem study showed that a strychnine concentration of 3.32 mg/l in the blood of the inferior vena cava was associated with concentrations of 11.4 mg/l, 2.42 mg/kg, 2.32 mg/kg and 98.6 mg/kg in bile, brain, skeletal muscle and liver, respectively . Of the 50 reported cases of strychnine poisoning in the past 36 years, only two nonfatal cases have included data on serum strychnine concentrations [19,20]. Both of these patients had much lower concentrations (1.6 mg/l at 4 hours after ingestion and 2.17 mg/l at 6 hours after ingestion, respectively) than that found in our patient. The elimination and metabolism of strychnine are poorly understood. Strychnine is rapidly absorbed from the gastrointestinal tract, with symptoms occurring within 10 to 20 minutes of ingestion [6,21]. It is also absorbed through other mucous membranes, as in poisonings when strychnine has been mistaken for cocaine . Strychnine has been shown in animal studies to be metabolised in the liver by cytochrome P-450 microsomal enzymes , but 1–30% is excreted unchanged in the urine [17,23]. The proportion of strychnine excreted unchanged appears to be smaller when larger amounts are ingested [21,24]. In our patient, elimination of strychnine obeyed first-order kinetics with a half-life of 12 hours. Only three other papers have reported on the elimination kinetics of strychnine, and these provide conflicting views of its toxicokinetics. Edmunds and colleagues were the first authors to describe the elimination of strychnine and theirs is the only other report on the kinetics of strychnine in a patient who survived . They reported a 42-year-old man who ingested an unknown quantity of strychnine and developed severe muscle cramps and convulsions and had a respiratory arrest 35 minutes after ingestion. In that case, the elimination of strychnine obeyed first-order kinetics with a half-life of 10 hours, based on 19 blood samples collected over a 53-hour period, the first of which was taken at 4 hours after ingestion. Palatnick et al. also reported first-order kinetics with a half-life of 16 hours, based on 18 serum concentrations over a 51-hour period in a 34-year-old man after ingestion of 125 ml of a 2% strychnine solution . Heiser et al. reported zero-order kinetics in a fatal case in a 51-year-old man who presented after ingesting 4.8 g of strychnine . His serum concentrations were measured in only five samples, ranging from 3.5 mg/l at 0.5 hours after ingestion to <0.1 mg/l at 43 hours after ingestion. The differences in the kinetics of strychnine found in our patient from the kinetics in the above three cases almost certainly reflect the influence of clinical parameters such as different periods of hypotension, metabolic acidosis and renal impairment, all of which would influence hepatic metabolism and renal elimination of strychnine. However, the calculated half-life of 12 hours in our patient is comparable to the half-lives previously reported (10 hours and 16 hours), suggesting that the true elimination half-life of strychnine lies between 10 and 16 hours. We describe a case of severe strychnine poisoning with a favourable outcome in which the strychnine half-life was 12 hours. The patient presented early, his symptoms were recognised and meticulous supportive care was instituted without delay. All of these factors were probably important in preventing what would otherwise have been a fatal ingestion of strychnine.